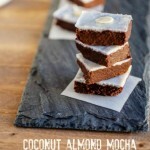 Grain free and delicious coconut almond mocha fudge. 1 cup granulated sweetener of choice: coconut sugar for paleo or for low carb use erythritol, or monk fruit sweetener (sweetener should be ground to a powder in a blender, processor or Magic Bullet type blender), or can use a low carb confectioners sweetener. Line an 8 inch loaf pan (a loaf pan is deeper and makes thicker pieces of fudge) with wax paper or parchment paper. Can also grease the pan, if you don’t have the wax or parchment paper. Grind up sweetener of choice in a blender or processor until powdered texture forms, set aside. In a medium size, heavy sauce pan over medium heat melt: ½ cup butter or coconut oil, and ¼ cup almond butter or sun butter. Stir together and continue melting. Once it is melted and combined, turn heat to lowest setting. Add to the melted butter almond butter mixture: 1 cup ground sweetener of choice, ¼ cup sifted cocoa powder, 1 tsp instant coffee crystals, and 1 tsp vanilla extract. Remove sauce pan from heat, and stir then ingredients together thoroughly. Pour or spoon almond mocha fudge mixture into the bottom of prepared loaf pan. Use a rubber scraper to get all the fudge mixture out of the sauce pan. Set aside. In a small heavy sauce pan over medium heat melt: 2 ½ tbsp coconut oil, 2 tbsp coconut butter, 1 tbsp coconut milk, and 1 1/2 tbsp sweetener of choice. Stir and melt until all ingredients are melted and combined. Remove from heat. Add 1 ½ tbsp fine shredded coconut flakes and stir. Pour coconut mixture over the top of almond mocha fudge in loaf pan. Refrigerate for 1 hour or until solid or can freeze for 20 minutes. Once solid, cut and serve. Store unused portions in the fridge.